The Italian Greyhound is an ancient breed that is believed to have originated in the countries now known as Greece and Turkey. A 6000-year-old Egyptian tomb shows dogs similar to the Italian Greyhound and they are also depicted on decorative Mediterranean art of 2000 years ago. By the Middle Ages, the breed had become distributed throughout Southern Europe and was later a favorite of the Italians of the sixteenth century, among whom miniature dogs were in great demand. Their name is a reference to the breed's popularity in Renaissance Italy. Although the small dogs are mainly companionship dogs they have in fact been used for hunting rats or mice, often in combination with hunting falcons. Italian Greyhounds are the smallest of the sighthounds. 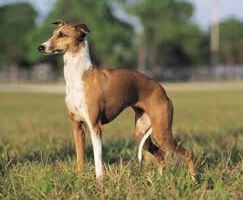 In appearance they closely resemble a small Greyhound with a lean, graceful body, long pointed face and small ears. They have a short, glossy coat that comes in almost any colour, usually with white markings. Italian Greyhounds will easily adapt to any living arrangement. They are fairly active indoors and will do okay in an apartment without a yard, however they tend to prefer spacious areas. They are not outdoor dogs and should not be left outside while you are gone, they are also very sensitive to cold weather (due to their short thin coats), so they like to be indoors when it’s cold out. They do best in a quiet household, and make good pets for everyone from the elderly, singles to families with older children. Their one purpose on earth is to love and be loved. They will follow you around everywhere you go, sit on the furniture, sleep under the covers in your bed. They can form very strong bonds with their owners but be careful not to baby and overprotect them as this will cause them to become snappish if they are frightened. They require a lot of attention and affection and may at times demand that you immediate drop what you are doing and give them attention. They do not graciously accept being ignored, some of them become destructive and unmanageable if left to their own devices. These dogs are very active and do need daily exercise, especially when they are young. They like to go for long daily walks and love to run but they are not likely to play fetch (they think of this as below them). Stuffed toys are their favorite and they have been known to shred them to pieces. Some of these dogs enjoy dog agility, but most of them are inclined for straight-out racing rather than for working tightly as a team with a handler on a technical course. Lure coursing is another activity well-fitted to the Italian Greyhound, and they seem to enjoy it tremendously. If they do not get enough exercise and mental stimulation they can become destructive. They should never be let off lead in an area that it is not safe to do so. They can spot things 300 yards away and due to their high prey drive they will chase anything they decide is prey: squirrels, ferrets, rabbits, cats, etc. They are also easily startled and may take off if something frightens them. They can run over 40km/p, so if they get away you won't be able to catch them - and they have no road sense. Breakaway collars are advised for identification, because this active and acrobatic breed could easily injure themselves when put in a collar they cannot escape from, and this leads to possible neck injuries and strangling. Italian Greyhounds make reasonably good watchdogs, as they bark at unfamiliar sounds. They may also bark at passers-by and other animals. However, they should not be considered "true" guard dogs as they are often aloof with strangers and easily spooked to run. You will often find your Italian Greyhounds on the back of the couch staring out the window or sleeping in the sun. They are also very curiosity and love to be in, around and on top of anything that they find interesting, if there are objects laying around they will steal, swipe, stashing or eat it. Care should be taken to make sure that they do not get into trouble or danger (keeping in mind that they are extremely fast, and able to climb). Outdoor activites can include digging small (or large) holes, chasing squirrels or birds, eating unmentionable things and occasionally clipping grass. Like a lot of small breeds the Italian Greyhounds is prone to developing Small Dog Syndrome, this is where the dog believes that they are boss and is due to the fact that the owner is too lenient with them and lets them get away with more that they should because they are so small and cute. This can lead to behavioural problems such as separation anxiety, guarding, growling, snapping, biting, excessive barking and untrusting of children and sometimes adults. To prevent this you need to give this dog rules, and limits to what they are and are not allowed to do; be firm and consistent. Don’t mind a dog that won’t always your every command. Which other breeds are most compatible with the Italian Greyhounds? The best breed to get with a Italian Greyhound would be a smaller breed so they are about the same size, you can look at breeds like Chihuahua, Maltese, Shih Tzu, Pekingese, Pomeranian, Whippet, another Italian Greyhound (of course), etc. If you are looking for a bigger dog it is best to get a calmer, easy-going breed as larger more playful dogs can accidently hurt the Italian Greyhound. Look at breeds like a Gray Hound, Great Dane, Labrador (once they calm down after their boisterous teen years), Wolfhound, Saint Bernard, etc. Italian Greyhounds gets along well with other dogs and cats. If socialized well they enjoy the company of people. However, the breed's slim build and short coat make them somewhat fragile, and injury can result from rough or careless play with young children. They are recommended for families with older children, who understand to handles theses little dogs with gently care. They are notoriously difficult to housetrain. Because they do not like to go outside if it is raining, snowing, cold, or if the wind is blowing, they often refuse to "do their business" outside. Some take months to housetrain, some years, and some are never fully housetrained. Some owners get around bad weather by using an indoor litter box, it works like a charm and these dogs train to litter boxes relatively easily. The Italian Greyhound is one of the easiest dogs to groom. They shed little to no hair and all that is needed to keep the fine, silky coat gleaming is a rubdown with a towel or chamois. Only bathe when absolutely necessary and after bathing make sure the dog is thoroughly dry and warm. Dental care is very important with this breed, their scissor-bite and thin jaw bones make them susceptible to periodontal disease, which can be avoided by brushing their teeth daily. They enjoy sunbathing and can get sunburned or overheated. Adult dogs are fairly hardy, however puppies are more fragile up until they are about eighteen months old, and they can break a leg rather easily. During this time be careful with them. A healthy Italian Greyhound can live as long as 18 years. 'Designer' breeders tried - and failed - to make the breed even smaller by crossbreeding them with other breeds of dogs. This only led to mutations with deformed skulls, bulging eyes and dental problems. The original Italian Greyhound had almost disappeared when groups of breeders got together and managed to return the breed to normal. James I of England, Catherine the Great of Russia, Anne of Denmark and Queen Victoria, all owned Italian Greyhounds. During the 1700s Frederick the Great of Prussia took one of these little dogs to war with him, and he buried the dog himself when it died at the Sans Souci Palace. It was Frederick's dying wish that he be buried next to his dog, so on the 205th anniversary of his death, on 17 August 1991, Frederick's family transferred his remains to Sans Souci, and placed them beside his little Italian Greyhound. Mummified dogs very similar to the Italian Greyhound (or small Greyhounds) have been found in Egypt, and pictorials of small Greyhounds have been found in Pompeii, and they were probably the only accepted companion-dog there. Nelly from the film Good Boy! 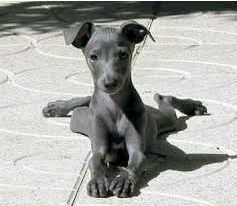 is an Italian Greyhound played by "Motif" and "Imp". The American rock band Shellac named their fourth album Excellent Italian Greyhound in reference to drummer Todd Trainer's pet Italian Greyhound, Uffizi. The 3.5 Edition of the Player's Handbook for Dungeons & Dragons features a sketch of an Italian Greyhound under its description for "handle animal." Vienna Teng wrote a song titled "Stray Italian Greyhound" that was inspired by Barack Obama's 2004 DNC keynote address. YouTube sensation Jenna Marbles features her Italian Greyhound, "Kermit" A.K.A. "Kermie Wormie" in her weekly videos along with her chihuahua "Mr. Marbles". The grace of the breed has prompted several artists to include the dogs in paintings, among others Velázquez, Pisanello and Giotto. Portrait of the aging Catherine The Great with an Italian Greyhound named Zemire. Leave them alone for long periods of time, they need human companionship.